Looking for Apple Picking Tips in 2019? Scroll down this page and follow the links. And if you bring home some fruit or vegetables and want to can, freeze, make jam, salsa or pickles, see this page for simple, reliable, illustrated canning, freezing or preserving directions. There are plenty of other related resources, click on the resources dropdown above. Apples are one of the easiest fruit to pick and use. They're big, not easily bruised, most varieties store well, they can be eaten fresh, cooked, canned, frozen and made into many tasty and healthy dishes. Apples are fat-free, low sodium, and cholesterol-free. A bushel weighs between 42 and 48 lbs. And if you're looking for many, many facts about apples, see this page! Select firm, bruise-free apples. The color can be anything from dark green, to yellow, pink, orange, bright red, dark red or even a combination. It all depends on the variety. And color is not really how you tell when an apple is ripe. Apples should be crisp and firm. The key will be to ask the farmer which are ripe. He will know because it is calculated from the number of days since the trees flowered. And he will track that date carefully , if he's a good apple grower! The farmer will also know what characteristics to look for in the particular varieties that he is growing. When are apples ripe - how to tell! Apples ripen from the outside of the tree towards the center, so the apples out the outside of the tree will ripen first. Once they are picked, they stop ripening. Picking apples directly from a tree is easy. Roll the apple upwards off the branch and give a little twist; don't pull straight away from the tree. If two apples are joined together at the top, both will come away at the same time. Don't shake the trees or branches. If the apple you are trying to pick drops, (or others on the tree) go ahead and pick it up. They're perfectly fine! But do wash them before you eat them! See this page for a much more detailed explanation about how to tell when apples are ripe and ready to pick. 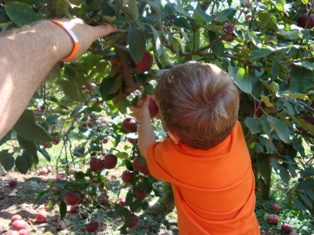 A visitor who grew up on an orchard says to try to leave the stem on the apples. He says that helped them store longer! Of the apple, that is. You really need to choose the type of apple that is best suited for your purpose. 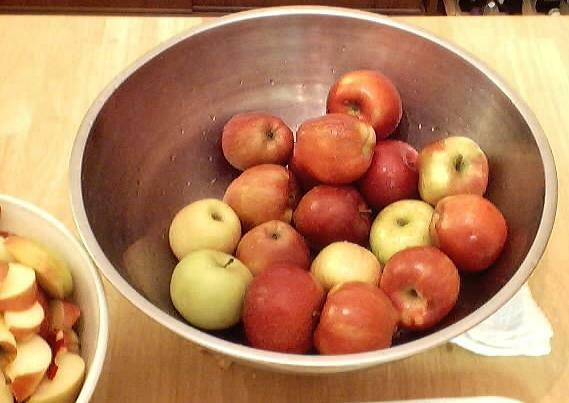 Apples can be suited for eating fresh, cooking, baking, applesauce, storing, etc. I have a fairly extensive guide to apple varieties here! Once picked, don't throw the apples into the baskets, place them in gently, or they will bruise and go bad more quickly. Don't wash apples until just before using to prevent spoilage. For an explanation of why apple slices turn brown and how to stop it, see this page! Keep apples cool after picking to increase shelf life. A cool basement is ideal, but the fruit/vegetable drawer of a refrigerator will work, too. Kept cool, fresh-picked apples will generally keep weeks, but it DOES depend on the variety. Red and Yellow Delicious apples do not keep well, for example; but Rome, do! High humidity helps to to keep the apples from shriveling, but don't let them get actually wet. A wet towel placed nearby helps to keep the humidity up. A refrigerator is fine for small quantities of apples. Boxed apples need to be kept in a cool, dark spot where they won't freeze. Freezing ruptures all of an apple's cells, turning it into one large bruise overnight. The usual solution is to store apples in a root cellar. But root cellars often have potatoes in them: apples and potatoes should never be stored in the same room because, as they age, potatoes release an otherwise ethylene gas, which makes apples spoil faster. If you can keep the gas away from your apples, they will keep just fine. Just don't store them right next to potatoes.